Pen-and-ink plans and elevations of small shrines on the margins of the Mana-sarova (Munsar) Tank at Viramgam by Sitaram Dinkar (fl. 1875) and Hari Gopal (fl. 1875) between 1884 and 1886. 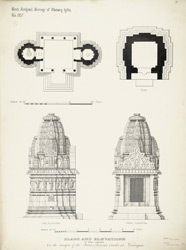 This image is from the Burgess collection, an album of 49 drawings of plans, sections, elevations, sculpture and architectural details of monuments in Ahmadabad and the surrounding areas made between 1884 and 1886. The drawings were prepared mainly by Indian draftsmen under the supervision of James Burgess (1832-1916) of the Archaeological Survey of India. The Munsar tank on the outskirts of the walled town of Viramgam is enclosed by scores of intricately carved temples dedicated to Krishna and Mahadeva. The tank was constructed by Minal Devi, the mother of Sidh Raja, King of Avhilvada (1094-1143) around 1090. Avhilvada, now known as Patan, was the capital of Gujarat in the 11th-12th centuries under the Solanki rulers who are credited with erecting some splendid architectural wonders during this period. The drawing shows plans and elevations of temples. The lower elevations show two shikaras or towers profusely decorated with figural and foliate motifs. The plans above give the layout of each.